Twitter's latest social media craze has been launched in protest of the US House of Representatives vote to cut funding for Planned Parenthood, the nation's largest women's health care services provider. Apparently there are tens of thousands of women who wish to publicly disclaim the stigma and shame that is associated with abortion. They cite various reasons -- convenience, immaturity, being too young, not being in a "good place", no support system -- as to why they have no regrets over ending the lives of the babies growing inside them. They want those of us who are Pro-Life and view abortion as a sin and murder to know that they are comfortable with their decisions and feel it is a woman's right to choose what she does to her body. But is it her right to take that choice away from her unborn child? Obviously, the Planned Parenthood videos have sparked a controversy that finds women taking sides on this emotional issue. For perhaps the first time since Roe v. Wade, the facade of the abortion industry (and that's what it is -- a lucrative business) have been unveiled. The Gosnell trial revealed the horror behind late-term abortions and nightmarish "abortion mills", but that was looked upon as an anomaly. Organizations like Planned Parenthood were still seen as providing necessary "services" to the modern woman. Until those videos, that is. All of a sudden, it became clear that it wasn't just tissue being vacuumed out of 55 million wombs, it was babies! The tide of public opinion was beginning to affect the national dialogue about abortion, and some women decided they needed to encourage women to reclaim that conversation. Amelia Bonow shared her own story on Facebook along with the hashtag, ShoutYourAbortion, and since then, thousands of women across the globe have detailed their experience(s). Another of the organizers of this campaign, Lindy West, stated that she was tired of whispering about her abortion; that she realised that, even among her pro-choice friends, she never, ever talked about her abortion. She joined Bonow in launching the #ShoutYourAbortion campaign because, "We need to chip away at stigma, at lies, at the climate of shame." Apparently others felt the same, as the campaign's Twitter and Facebook pages went viral. Comments included the following: "Honestly, my abortion at 20 was one of the first responsible, non-self-destructive, grown-a** choices I ever made" ... "I was 20, in school and my birth control failed. I did not want a child. It was the right choice and I've never regretted it" ... "To say choosing to have an abortion was the hardest decision I've made would be to lie. It was easy. Tears but no regrets" ... and what I think is the most narcissistic comment I've ever read: "I've had 2 abortions. I don't have to justify or explain them to anybody. My life is more valuable than a potential life." Some commenters even remarked that they were sobbing over being shed of the guilt and shame, and were so grateful that they could "come out of the closet", so to speak, and were so happy that they could finally "shout about their abortions". It's all summed up in this evil comment from an article in an alleged medical ethics journal: "… Although fetuses and newborns are not persons, they are potential persons … If a potential person, like a fetus or a newborn, does not become an actual person, like you and us, then … there is no harm at all … The alleged right of (fetuses and newborns) to develop their potentiality … is over-ridden by the interests of actual people (parents, family, society) to pursue their own well-being." But, as always, there are two sides to every conversation, and there is some sobbing going on among those women who have a different view of the abortions they experienced. #ShoutYourAbortion-Regret gave women who mourned their abortions the opportunity to tell their side of the issue. 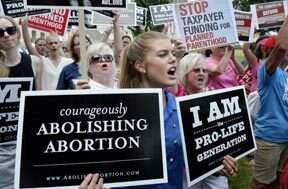 They, too, have spent many years in silence, not even daring to whisper of the physical pain and emotional trauma that abortion heaped upon them. Their stories are eerily similar; the screaming of their consciences that the procedure was wrong, but they listened to the lies of the nurses and doctors that told them they would soon be rid of "it" and back to their old selves. It makes me wonder how many of the 55 million moms who aborted their babies share the feelings of this woman: February 19th, 1994 will be a day I will never forget … the day I had my abortion and selfishly took my child’s life. I was not ready to be a mother and I thought I would disappoint my family, so I chose to end my child's life. This was the day that chained me to silence, and began a LONG and PAINFUL road of emotional roller-coasters, ‪self-destruction‬, alcohol use to numb the emotional pain, shame, guilt, and anger, just to mention a few of the “side-effects” of my abortion. The abortion clinic workers never warned me about the certain destruction of ‪Post-Abortive‬ ‪Trauma‬. I remember being emotionally numb, stuffing my fears and doubts as far away in my mind as I could, so I could get through the “procedure”. The workers at the clinic told me: “It’s just a mass of tissue, nothing to worry about” (LIE #1); “This will be a fairly quick procedure, you will feel a little bit of discomfort, but when it’s done, you won’t have to worry about “IT” anymore” (LIE #2); “It’s OK! You’re almost all back to normal now” (LIE #3). A decision made, based all on a woman’s right to choose and masked by a series of LIES! I left the clinic that day with a sense of relief “it” was done, not knowing the pain that lie ahead. There you have it --- For the first time since I can remember, the issue of abortion is being put under a glaring spotlight. The layers are being peeled away and the mask has come off. It is so much more that the "right" of a woman. It is destroying a life, and just because there are women that want to shout it from the rooftops so they can develop a sisterhood and feel vindicated, it doesn't wash away the sin and its effects. This #ShoutYourAbortion campaign has only served to spotlight the self-absorbed, egocentric personalities of women who are celebrating killing their child as a false sense of emancipation. There will come a day when they must face the truth about what they've done, and I pray that they will repent and seek forgiveness from the One who Created them. But to flaunt their deed as if it was some sort of badge of self-empowerment is to diminish the eternal consequences of their actions.